1. Scoop flesh from avocado halves and place in blender, with greek yogurt, lime juice, and ¼ cup of cold water. Blend till smooth. 1. In a bowl place all ingredients, except sesame seeds, mix until well combined. 2. Place in refrigerator, allowing tartare to marinate for 15 to 20 minutes. 3. When ready to serve, add sesame seeds to tartare, mix till combined. 4. To serve, create a smear of avocado crema on the plate. At the narrow end of the smear, using a small to medium round form, create a small tower of tartare by spooning the tartare mixture into the form and gently pressing down using the back of a spoon. Remove the round form from the tartare and serve immediately. 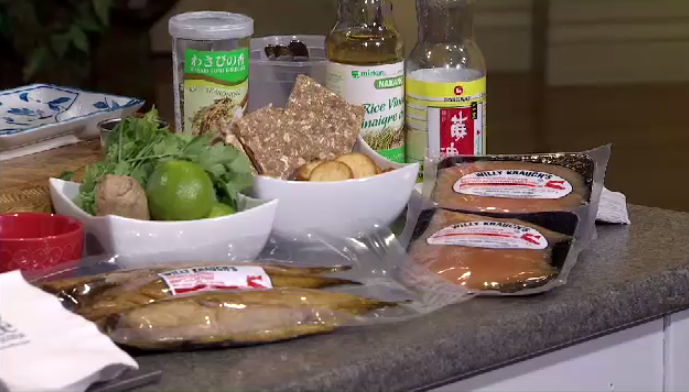 Chef T.J. Pittman of Comeau Sea Foods shares his recipe for ginger and sesame smoked salmon tartare with avocado crema.